Casting slip consists of very fine clay powder, selected raw materials, water and deflocculants, which help keep the clay in suspension. When poured into moulds made of potter’s plaster the slip can produce very intricate and delicate ware. Moulds may range from a simple one piece open bowl to an intricate multi-piece figurine mould. The casting slip is poured into the mould, left to form a thin layer or cast of body as the water is drawn into the mould, the excess clay is then poured off and the cast is allowed to set or dry naturally. Once the cast has set or dried sufficiently it can be removed from the mould, dried, fettled, decorated and fired in the usual manner. Make sure the prepared slip is thoroughly mixed. Use a glaze stirrer fitted to an electric drill to ensure a smooth mixture. Ensure that no air is drawn in to the mixing slip. Sieve the slip through an 80 mesh sieve. Place the mould on a stable, level surface. 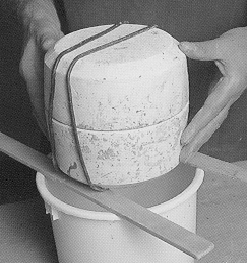 Pour sufficient slip to fill the mould into a jug or similar container. Commence pouring the slip into the mould. The mould must be filled in one smooth operation ensuring an equal distribution of slip to all parts of the mould and preventing casting marks. Ensure that the mould is filled completely to the top. Check the mould after a few minutes. It may be necessary to top up the head/spare. The absorption that may have occurred results from the moisture within the slip being taken up by the plaster. Allow sufficient time for the thickness of slip – approximately 5 mm for smaller pieces and thicker for larger – to build up. This will vary according to the clay used, the age of the mould, the atmospheric temperature and intricacy of the design. Carefully tilt the mould to an angle of between 50-60° to test the skin thickness by cutting into the spare at the top of the plaster mould to see its thickness. When the cast has reached the desired thickness the excess slip can be poured out and intitially left on an angle while the slip runs out. The mould can now be turned upside down to finish draining over a bucket. This may take ten to fifteen minutes after which the mould can be stood the right way up. 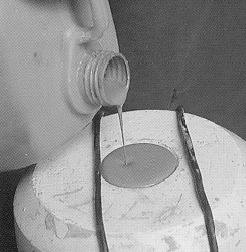 When the “shine” has disappeared from the surface of the cast it is possible to clean up any drops or spills from the top of the mould. Set the mould aside to dry sufficiently to shrink and allow easy removal of the cast piece. Once the cast is leather hard it can be trimmed, fettled and sanded, ready for decorating or glazing. When finishing the surface of the cast it is recommended that a dust mask is worn. To view our range of casting moulds vist our online shop.